The opponent stood motionless and stared me down. No sound. No feeling. Not even an emotion. He could do nothing and win. For me there was no choice. I was sweating and feeling fear. The tension was palpable. And I had to do something. A pile of six bricks was staring right back at me. I wasn't sure what was causing more pressure on me. The thought of my hand potentially breaking as it was going through this stack of stone, or dozens of people watching me. What if I failed by either account? I had been promoted to black belt 6 months earlier after years of Karate training and I'd broken wood before. But bricks? This would be a lot harder. A visiting karate master teaching us how to break stone took me aside. Quietly he told me the whole point in this exercise is not to focus on the bricks, or to worry about what happens to your hand when it hits them. Just focus on the end state you want. A large and muscular man weighing about 230 pounds he was a world champion breaker. He walked over to the stack of stone and gently caressed it with his hand. He then looked at me and said "You can do this." Just get in touch with your feminine side". 6 months earlier I was sitting in the luxurious Athenaem in London on my first of what would become over 2 dozen trips to one of the world's greatest cities. This fine hotel sits across from the idyllic Green Park. They are known for their afternoon tea with scones and clotted cream. I love afternoon tea. It is really one of life's true pleasures. Relaxing with a friend or loved one. Sipping tea. Eating sweet delicious things. A calm sets over that is so serene, especially in beautiful surroundings. It is seated meditation. And those scones...a mouthful of heaven...Soft but with a pleasing texture...Just a touch of sweetness...So very feminine. I consider myself to be well adjusted from the Y chromosome perspective, as well as up for a challenge. Which is why I am posting this story and recipe. You see, unlike all of you talented (and mostly female) bakers in the blogosphere, I am absolutely terrified of baking. I would rather break bricks. Cooking is one thing. Some technique sure. A pinch of this. A little bit of that. I have never found cooking to be that difficult because one can always recover from such a casual approach. But baking? Not a chance. No room for error. Absolute precision in technique. Can men really do this? In the month I have been food blogging I have watched some of you and what you can do. And you are Masters. Tartelette, your publishing accomplishment speaks to your high rank and stature as a baker. Canelle et Vanille, the precision shown in your photographs is unmistakable and looks effortless. La Tartine Gourmande, a powerful and indisputable femininity that is fully in control of the kitchen. I don't know any of you. But you are all my teachers. For this recipe, I wanted to do something that challenged my fear of baking with my first "Sugar High Friday" entry. Pressure, I know. But I like pressure when I cook. I do my best this way. I have never made scones, I have only eaten them. I worked with a recipe from the Joy of Baking and modified it based on what I wanted as the end state. To capture and re-create the pleasantly soft texture of a freshly made scone in London. 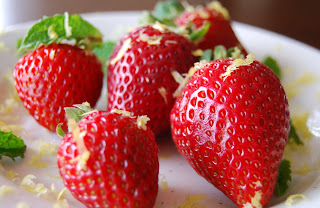 Since we are in the height of strawberry season, and use of that ingredient is the requirement of the SHF challenge, I wanted to incorporate an unusual aspect to the recipe. I gently mascerated the strawberries in aged balsamic vinegar, and dusted them with freshly ground pepper prior to baking the berries into the scones. A pleasing sweetness with a touch of spice. Certainly one definition of femininity to me. And I gently topped the finished strawbery scones with a glaze accentuated by lemon zest. Harmony. Balance. Zen. Making the scones was like martial arts training because it required such concentration. First, I had to measure everything exactly. My dear wife (the baker of the household) handed me a set of measuring spoons. "What are these? Why can't you just use a pinch or a handful" I asked. "Baking has none of that" she said. I felt the tension and out of my element. It only got worse. The recipe called for "using a pastry blender or cutting the cold butter with two knives so that the flour and butter mixture looks like course meal". The knife thing sounded kind of macho, sort of like close combat hand to hand fighting with a Ginsu. I went with that technique. Doing the cutting was a zen-like activity. It took 15 minutes to complete and my forearms were in agony. But I became one with the butter. Finally, I got to improvise. The recipe called for regular plain vanilla yogurt mixed with vanilla extract. We had Brown Cow Cream Top Vanilla so I used that and it felt good...until the fear set in. Would these scones be dry and tasteless? A failure in execution? My first real attempt at baking in such a public forum leaving me crushed? I must say that the end product was moist and succulent. The scones came out well. Although some scone recipes are purposefully dry, I personally don't enjoy that kind of texture and the yogurt eliminates this problem. The balsamic mascerated strawberries lend a complex but sweet taste that I find very complimentary to a scone as well. I have taken the first small step in overcoming my baking fear. I really enjoyed this Sugar High Friday challenge and I want to thank Jennifer of Domestic Goddess, the force behind SHF, and fellow San Diegan Susan at Food Blogga for hosting this month. Thanks for letting me share my journey with all of you. By the way, I ended up breaking the bricks. But that was significantly easier than baking these scones. In a small bowl add the whole strawberries and cover with the balsamic vinegar. Sprinkle the sugar over the berries and toss to coat. Let this sit for 30 minutes to 1 hour. Chop the strawberries into small 1/4 to 1/2 inch pieces and discard the remaining balsamic liquid. of oven. Line a baking sheet with parchment paper or use a silpat. In a large bowl, whisk together the flour, sugar, baking powder, baking soda and salt. Cut the butter into small pieces and blend into the flour mixture with a pastry blender or two knives. The mixture should look like coarse crumbs. Stir in the chopped strawberries. In a small measuring cup whisk together the yogurt, vanilla extract, and egg. Add to the flour mixture and stir just until the dough comes together. Do not over mix. Transfer to a lightly floured surface and knead the dough gently four or five times and then gently form the dough into a circle that is about 7 inches (18 cm) round and about 11/2 inches (3.75 cm) thick. Cut the dough into six triangles. Place the scones on the baking sheet or silpat. Bake for 18 minutes or until golden brown and a toothpick inserted in the middle comes out clean. Let the scones cool. In a small bowl combine the powdered sugar and lemon juice. The mixture should be slightly runny. If it is dry add a little more lemon juice. Add the lemon zest and mix to combine. Brush the glaze over the top of the scones and serve. I think you did great with this bricks, scones I mean, lol! Strawberries and balsamic in a scone must be wonderful. I also love afternoon tea! wow - you should be impressed w/ yourself. i feel exactly like you do about baking. but, i don't know if it's a male/female thing cause my husband loves it and is much better at it than i am. but i absolutely hate it. i cook well cause i don't need to follow any measurements exactly!! these look awesome and even my british husband would approve! Well you did an amazing job! You are on your way to many a homemade baking delight! Congrats. Marc: thank you for the compliments but my stature does not look as good covered in an exploding bag of powdered sugar! This post is everything it should be, Marc-- insightful, clever, and delicious. I have found with baking (sort of like with public speaking) that once you conquer that initial trepidation, each subsequent encounter becomes easier. Your confidence builds, your scones get even better, and pretty soon you're baking bricks all over the kitchen. The bricks didn't have a chance... You seem to be a man who faces his fears head on. The results show because these scones look amazing. The balsamic strawberries must add such complexity to these melt-in-your-mouth scones. Very interesting! The recipe sounds wonderful! Those scones look really good! Hi Marc! Thanks so much for your words. You are too kind! These look great and keep up the good work! i am not a baker. i'm getting better but still not a baker. i guess i'm more in tune with my masculine side...hmm, i wonder what that says about me? i am smacking my head against the desk right now because someone should have thought about this combo for scones a long time ago. i think this would work beautifully. i can't wait to try them. Breaking bricks sounds really impressive and those scone look amazing! but thats so lovely!...thanks..you really have an impressive blog..good going! strawberries are lovely but I have never tried scones! The scones look amazing...what an aweseome combination. I definitely have to try these. Then I'll smash something up and feel complete! Something about strawberries and balsamic vinegar...! And scones? I adores scones. I will try these for sure! Strawberry and balsamic vinegar is a really nice combo and these scones look great!